Another Post! 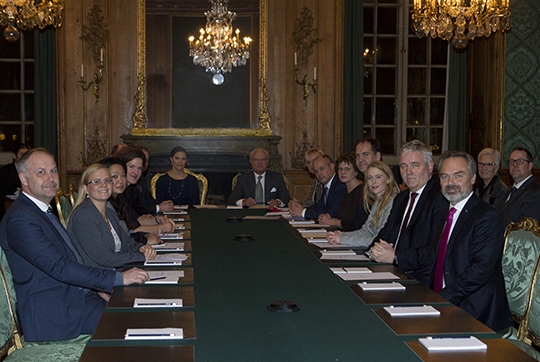 Apparently this evening Carl Gustaf and Victoria held an Advisory meeting at the Royal Palace in Stockholm. 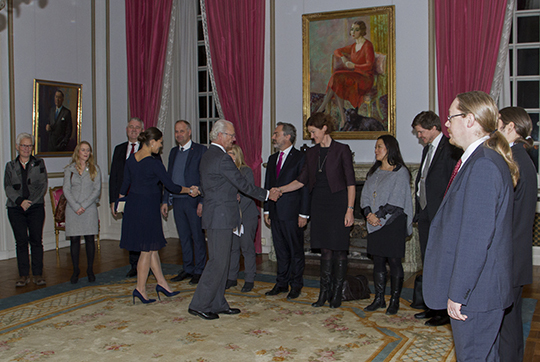 And Victoria changed for this occasion. I don't know why- I don't even think it was on the public calendar- but here it is anyway! 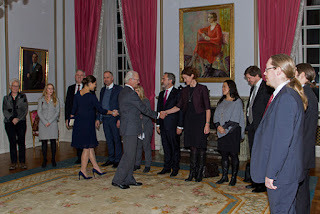 Victoria wore the same Seraphine dress that she wore back a few weeks ago when she attended the Dag Hammarskjöld Lecture given by Nobel Peace Prize Laurette José Ramos-Horta. You can read my recap of that event HERE. 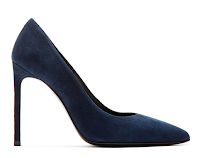 She appears to be wearing her blue YSL pumps but the photos are not that great and I am still honing my shoe identifying skills. I also imagine that she is wearing a necklace from Kreuger Jewellery (this one probably) but that is probably too far of a stretch to say for certain. It should be noted that this same dress was worn by the Duchess of Cambridge when attending the December Meeting for the 1851 Trust at the Goring Hotel. You can read about that visit and see photos here.